NEW YORK — The National Institute for Reproductive Health (NIRH) today announced that it is working in partnership with advocates in 22 states, including 11 localities, in 2017 to advance reproductive freedom at the state and local level. 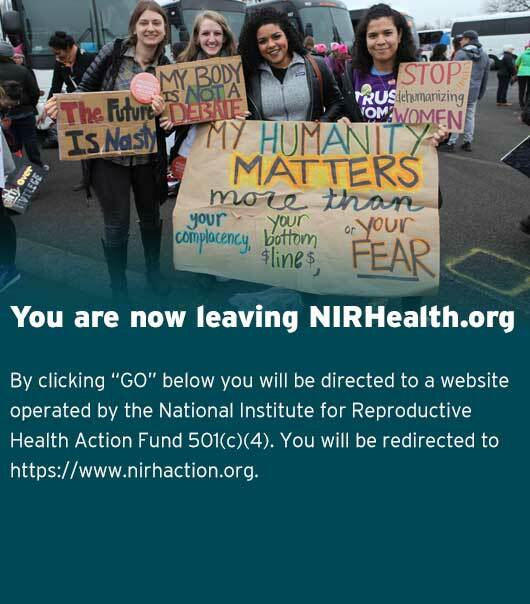 NIRH and its political arm, the NIRH Action Fund, also unveiled a bold and vibrant new look to underscore its proactive and unapologetic approach to reproductive freedom. Together with this new crop of 2017 partner organizations, NIRH is working to advance initiatives to protect and expand access to abortion care in Colorado (Denver), Connecticut (Hartford and Middleton), Georgia, Illinois, Kansas, Michigan, North Carolina (Durham County), North Dakota, Oklahoma, Tennessee, Texas (Dallas, El Paso, and Houston), and Wisconsin; improve access to contraception in Illinois, Maine, Massachusetts, and North Dakota; secure confidentiality in reproductive health care and promote reproductive justice for incarcerated women in Massachusetts; and foster youth-led advocacy in California (Los Angeles), Pennsylvania (Harrisburg Capital Region), and Tennessee. See the full description of each of the 2017 partnership projects at nirhealth.org. Working closely throughout the year, NIRH encourages and supports partners in taking calculated risks, pursuing bold strategies, and developing innovative, proactive approaches to expand access to reproductive health care, particularly abortion. In New York, NIRH is using these same strategies to increase access to abortion and contraception and to foster a new generation of activists. “This is how change is made: by working together to strengthen state and local movements to defend our rights, demand access to care, and control our futures, we can create lasting impact and shape the course of the nation,” Miller said.